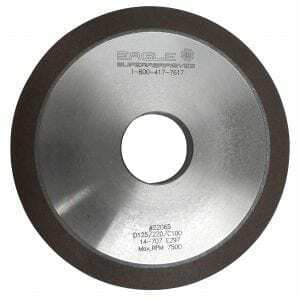 Eagle Superabrasives is a premier supplier of superabrasive supplies in the United States. With an extensive inventory of over 6,000 Diamond Wheels and CBN Wheels in stock at our Hickory, NC location, we are able to ship ninety-percent of orders same day. Custom orders can be filled in as little as seven days. Diamond and CBN Wheels are currently fighting for the spotlight in the grinding industry. With an industry that mostly relied on Diamond, as the superabrasive choice for grinding difficult to grind (DTG) materials, CBN has quickly become a rival of diamond. Diamond is the hardest material known to man, but chemist have created a man made material that rivals the strength of diamond, which has become known as CBN. CBN stands for cubic boron nitride, a superabrasive that offers the hardness of diamond, cool cutting and the ability to work with ferrous materials, unlike diamond. Diamond and CBN have the same crystal structure, with diamond consisting of pure carbon, whilst CBN is made up of the elements boron and nitrogen. Due to its carbon makeup, diamond is not able to grind ferrous materials. In contrast to Diamond, CBN has no carbon atoms, making it suitable for machining ferrous materials. Our Diamond Wheels are particularly suitable for working with all grades of carbide metals, hard faced alloys, sapphire glass, graphite and many other materials. Our CBN Wheels are better suited for machining hardened steels, high speed steels, stellite and nickel based alloys. dvantages of implementing either a diamond or cbn wheel into the workplace. It is important to know which wheel is best for the material that you will be working with to ensure that you are getting the most productivity out of the wheel. Each will increase your productivity rate as well as save you money in the long run due to fewer wheel changes and less breakdown of the superabrasive material. 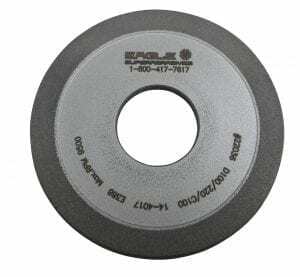 When you’re ready to try the best, trust the experts at Eagle Superabrasives. We pride ourselves in offering the best grinding wheels as well as the best customer service to truly enhance your purchasing experience. Our friendly staff, will provide advice and support along the way, answering any questions that may arise. Contact us today!